MIRANSHAH, Pakistan — The Pakistani Taliban Thursday said teenage activist Malala Yousafzai had done “nothing” to deserve a prestigious EU rights award and vowed to try again to kill her. The European Parliament awarded the Sakharov human rights prize to the 16-year-old, who has become a global ambassador for the right of all children to go to school since surviving a Taliban murder attempt. Malala survived being shot in the head by a TTP gumnan on October 9 last year and is seen as a leading contender for the Nobel Peace prize, to be announced on Friday. “She has done nothing. The enemies of Islam are awarding her because she has left Islam and has became secular,” Tehreek-e-Taliban Pakistan (TTP) spokesman Shahidullah Shahid told AFP by telephone from an undisclosed location. Malala and moved to Britain in the wake of the shooting for treatment and to continue her education in safety. Feted by world leaders and celebrities for her courage, Malala has addressed the UN, this week published an autobiography, and could become the youngest ever Nobel Peace Prize laureate on Friday. 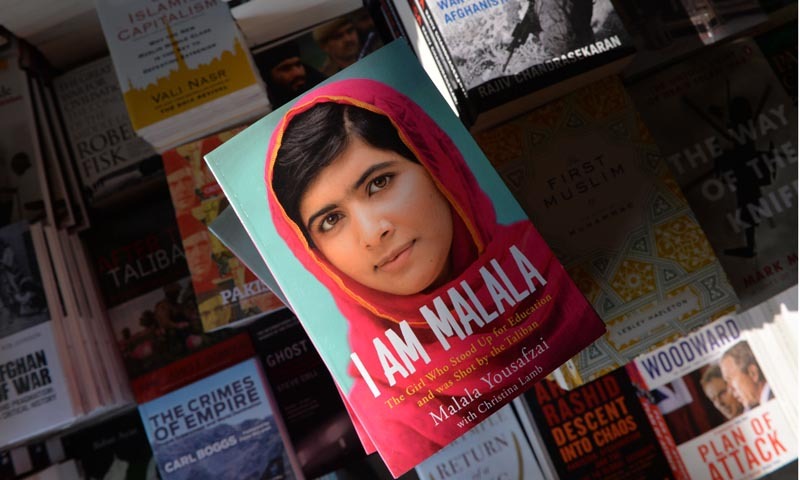 Her autobiography “I am Malala,” written with journalist Christina Lamb, has gone on sale in Pakistan and Shahid warned the Taliban would target bookshops stocking it. The Nobel Peace Prize for 2013 is to be awarded to the Organization for the Prohibition of Chemical Weapons (OPCW for its extensive efforts to eliminate chemical weapons ... Malala is the youngest person ever nominated for the Nobel Peace Prize. this prize was given to obama.......................... enough said. Its BS of west just like the prize in the KG class. No real value. Malala Yousefzai is a great girl who has a great vision for this world. She is talking about education and I think only a good education can save the world from the destruction that USA and terrorists are causing. Atleast she had the courage and said directly to Obama administration that drone attacks are counter-productive, illegal and must be stopped. Unlike the CIA boot-lickers like Kiyani and Busharraf who have secretly signed drone attack deals with UniTerrorist States Of America. It was confirmed by WikiLeaks. PESHAWAR: When Taliban say something, the people of Peshawar listen and local businessmen take the words seriously, as well. The militants’ sinister influence on public life is a reality no one can avoid. Taliban are a reality, they are going to stay here in the foreseeable future, and they mean business about their decrees. People know all this very well. That’s the reason when Tehreek-i-Taliban Pakistan (TTP) banned Malala Yousufzai’s memoir ‘I am Malala’, it was taken seriously. A major book selling firm of Peshawar cancelled its ‘I am Malala’ purchase order the day the Taliban decree was published by local newspapers. “Who can dare ignore their words, they will blow us up,” said a sales representative of the company. Fear defines the choices people make these days in this city. So many deaths and sufferings have been suffered at the hands of the forces of dread and doom that the people have developed the knack to acknowledge the expanding Taliban threat. They were left with restrict mobility long ago. An ineffective network of military and police checkposts, thrown in and around the provincial metropolis, carries a strong bearing on the city dwellers’ daily life. Long queues of vehicular traffic at these checkposts have won a general public acceptance. The closure of previously frequented city roads has become a reality to live with. Music parties on weddings are not considered a good idea, these days. Numerous local musicians have either migrated to other areas in the country or gave up their profession. The people avoid open and frank discussions about matters relating to religion. Late night, travel is not considered safe to-and-from areas in close proximity to Peshawar. The militants’ pronouncements hold sway over the people’s personal preferences and political thoughts. Sanity is losing space to fears of dread. An element of resilience,characteristic of brevity is there in public response to the Taliban threat. The submissive resilience is more of subjugation to the Taliban tyranny. “Please don’t put that book (I am Malala) on sale here, we don’t want to get killed in an explosion at this place,” said a female customer, interrupting the salesperson when he was talking to another customer about the book store’s decision to cancel its initial order for 20 books. “A good number of the people have contacted us, but we asked them to contact booksellers in Islamabad,” said the bookseller. “We can’t take risk with people’s lives after the Taliban decree,” remarked another salesperson. He said bookshops at Islamabad had removed the book from their display shelves. His words conveyed a mix of surprise and shock. However, he was not wrong. A major bookseller in Islamabad, originally a Peshawar-based company, which wound up its business from the provincial capital in 2011 due to the growing Taliban danger, is not selling the book either. “We are not selling the book and don’t know who is the distributor,” said its representative when contacted. A growing space is being lost to the militants who have apparently been given the ease to take initiative and decide what is good for the people at large. Taliban are a reality hard to miss, they decide what people should wear in schools and universities, whom they should not vote for in the general elections, and now they have also assumed the role to decide what people should not read. Co-existence with militants is the name of the game. This grand exhibition of Malala by the west is simply their way of telling the world....."this is what we are going to nurture for the coming years to control the new Pakistani generation". It does not take an idiot to realize that they are simply nurturing western puppet who would then enter Pakistani politics with boats loads of cash and other assets from the west to win in Pakistani politics to simply do the west's bidding. This happened before, they are doing it again, and we are still stuck with the same primitive mindset akin to sheep. The bullet that Malala took was from TTP (CIA sponsored group) and Malala is also a West sponsored "agent in the making". Someone explain to me as to how a common school girl of Swat; where almost all students speak sub-standard english; at the age of 14 can write exceptional english which resulted in the Daily Diary that Malala used to write during the TTP occupation of the city? This diary that has ever since been so heavily sponsored by western media that it was almost obvious as to their agenda. There are numerous people in Pakistan fighting for human rights and women rights and gay and lesbian rights for ages and all having their bits of success. Why haven't they been picked up as a role model? Many have even dies for such rights. What about them? What makes Malala so unique? Is the bullet they intended to plant in her brain??? Its a big game and she is the star puppet that is to be used so as to control Pakistan. I see it happening at least 10-15 years down the line. Come on guys.. Her message is for education yet we still believe she is agent..
60 % literacy rate and still improving. universities in Pakistan are open for anyone who can make it incl girls. females in my office run logistics, contracts, and procurement. . we even allow them to fly mach 2 jets..
My father went to Quaid-e-Azam university in Islamabad more than four decades ago. He said at that time there were between 20-30 girls in the class and about 3 or 4 boys. I visited a few universities in Pakistan in 2010, and majority of students were girls. My village is in a very remote part of northern Pakistan, and all girls in my village go to school without any problem. There are many problems in Pakistan, but girls not being able to get an education is not one of them. There is problem when the Taliban control the region; the problem that has been brewing for the last 10 years, not when your employees or parents graduated. Keep the timeline in perspective at-least, if not the region. If you cared to read my post carefully, I mentioned both timelines; the present and the past. Infact it is in the last few years that female education has really started to gear up in Pakistan, including KPK and tribal areas. first revelation to our noble prophet from the Almighty--an illiterate person---was Iqra. He did not remain in his state of illiteracy. Yet these self appointed custodians of of Islam are threatening a child who spoke of every child's right to an education. How far has Iblees led us astray. including KPK and tribal areas. Islamabad or Lahore doesn't count as Taliban controlled regions. They have and still blow up schools where girls attend. Jan 13, 2011 - Afghanistan minister claims leadership has undergone 'cultural change' and no longer opposes female education. May 30, 2012 - Number of destroyed school in Mohmand Agency reaches 97. Now that the reality check is complete, could the thread continue, or you still wish to live in denial? So schools were bombed in FATA and KPK, so? Mosques were bombed, Sufi tombs were also bombed. People dont stop going there as well. In 1997, there was 1 girl for every 5 boys enrolled in a primary school in FATA. In 2007 there was 1 girl enrolled for every 2 boys. Unfortunately, despite the fact that all statistics (government and independent) shows that school enrollment has increased in KPK and FATA over the last few years, some Pakistanis want to convince the world otherwise. I think the media is lying. Islam is for girl's education. Malala is just a tool, 4 months from now people will forget her and nobody will care. The media talks a lot of nonsense. I heard the real reason Malala was shot was not about education but was because TTP thought she talking against them. Malala is just a tool. Everybody knows Islam is for girl's education. Go to Saudi Arabia, and see hoe much they did for girl's education. I have to agree with skull-buster, girl's education is not an issue. We are improving our situation slowly but surely. Look....right now nothing is being spared. So taking snippets of news only depicting TTP in destroying girl's schools would be a gross understatement as to the scale of attacks they are conducting in Pakistan. They are targetting everything and everyone. THAT IS A REALITY CHECK!!! As such, I still stand firm regarding Malala and the brain-washing machinery set forth by the west to condition us into accepting Malala as a potential alternative in Pakistani politics sometime down the line in 10-15-20 years from now. I just hope that smart people don't fall for this scam but rather rally up and make sure she does not pave the future of our country without excessive scrutiny. I am not against Malala...she can continue to have share of fights for girls education in Pakistan...so long as she keeps her western compatriots at bay. 97 girl's schools were bombed until 2009, I posted the link above. I can safely say, without reading any stats anyone posts, that after 100 schools were bombed, chances of girls graduating are dismal; Unless someone proves those 100 plus schools were rebuilt overnight. Without schools, how can there be an increase in enrollment, be real please. You love Pakistan and don't want negative news emerging, and I get that. But lying about it and leading others astray? Edited by Felicius, 21 October 2013 - 11:20 AM. Wah ji, all statistics dont matter, some news snippets do. UN and INGOs are lying, you are correct. Talk about denial. 97 girl's schools were bombed until 2009. Until 2007 there were roughly 2,500 government girls schools in FATA and 10,000 girls schools in KPK. Why is it so difficult to understand why enrollment cannot increase even if 97 out of 12,500 + schools were bombed? (even assuming that no school was rebuilt) Enrollment increased in KPK and FATA because more and more people enrolled their children in existing schools. During the recent KPK enrollment drive, more than 200,000 children have been enrolled in schools in the province in a span of a few weeks. They didnt build any new school or classrooms in this time, but they convinced parents whose children were out of school to enroll. Also by the way, 1200 new schools were built in KPK between 2007 and 2011. Yes, and it's safe to assume over a 100 have been blasted after 2009. Hence, Malala is right in her own ways to fight for girls education. If it's not denial then what part of you is justifying that she is doing it because another power is pulling the puppets strings? She was shot before she rose to fame, not after. Pakistani society is becoming loaded with people having negative thoughts who do their best to influence and mislead others. In that alone lies the biggest problem that envelops Pakistan. Malala was fighting for this case long before anyone knew her name. Her motive was nothing more than girls education. Along the way she was shot, and she received some fame. Just as much no one protected her when the Taliban warned her, just as much no one saved her from being shot, she is not asking for anyone's approval after she received fame. Edited by Felicius, 21 October 2013 - 07:44 PM. Pakistani society is indeed loaded with people who have negative thoughts BUT it is equally loaded with people who are naive in perceiving a long-term threat. That has been a core dilemma for the Pakistani nation and continues to be to the present day. I will make this simple. You can support Malala all you want and believe in what the west is projecting. However, what I am emphasizing on is that although the real enemy is TTP, they are the tool of the West and likewise, they are using Malala as a tool as well. Next, the West they are going to use both of these tools to further their agenda by cooking the story they intend to cook to brainwash people so that dummies like us will then accept Western opinions, values etc. etc. They make themselves look the champions of Human Rights while we look like the fools we are. So, please connect the dots rather than stating the obvious and madly defending Malala. Please see the bigger picture and you ought to see the rest. The West maybe using her as a tool now, but perhaps not for the reasons you analyze? Firstly, she became a tool after she was shot, not before. We all know that she was fighting for girls education much before she became a tool, much before she was even shot. The agenda was hers, not the West's - the reason she was nominated for the Noble Peace Prize; at such a precarious age she is defying all odds and fighting for girls education. It was all her and not the West. The West stepped in after she was shot, correct? The West are supporting her to defame the Taliban even further, lose support from the few who still support the Taliban. West got the results too, as clearly when the Taliban commander wrote an open letter to her that he is sorry that she was shot and if he was not incarcerated he would've made sure that she wasn't shot. She was defaming the Taliban from the word go (wasn't the West's idea), the West later started supporting her. You call that support being a tool, sure, be biased all you want. Every incident is not a conspiracy theory my friend, and everyone who don't subscribe to a conspiracy theory is not being naive - At times one must allow common sense to prevail. Edited by Felicius, 22 October 2013 - 08:43 AM. Generally speaking all of us who come across as naive are perhaps optimistic and harbor great hope in the Almighty's blessings, in other words are holding strong to our faith in the Creator and His wisdom and benevolance in the face of all trials and tribulations that no one can avert their gaze from. For some, if not most of us the issue isn't madly defending Malala, rather it is about the right to education and the importance of establishing the fundamental foundation of the next generation of educated and aware mothers who will deternine the qualities of Pakistanis. After all true values and mores are established and aquired at home. Besides this there is the issue of standing for principles in the face treat, that is called courage. As to being used as a tool, whose to say who is using who; that street goes both ways. Her accepting Western awardsand recognition undermines the extermist forces and drives home a much needed reality check of how far we as a society have deviated from what we are supposed to have been. Enrollment and attendance are two very different things. I was in Pakistan a few months ago, we travelled safely in AJK but avoided Pakistan due to risk of terrorism. There are tens of millions who live and survive in Pakistan every single day. Does this mean there is no significant threat of terrorism in Pakistan? When we stop trying to "not look bad" we might be able to move on. I don't understand why there is no conspiracy theory about the othe 40,000 dead due to terrorism in Pakistan? Nobody wants to dig up graves to check for corpses or carry out autopsies to ensure those figures are correct? Maybe it's because they suit our narrative and Malala Yusufzai is judged by some not too? TTP attacks Police checkpost it's a real threat, TTP shoots a girl, it's a western consipracy. 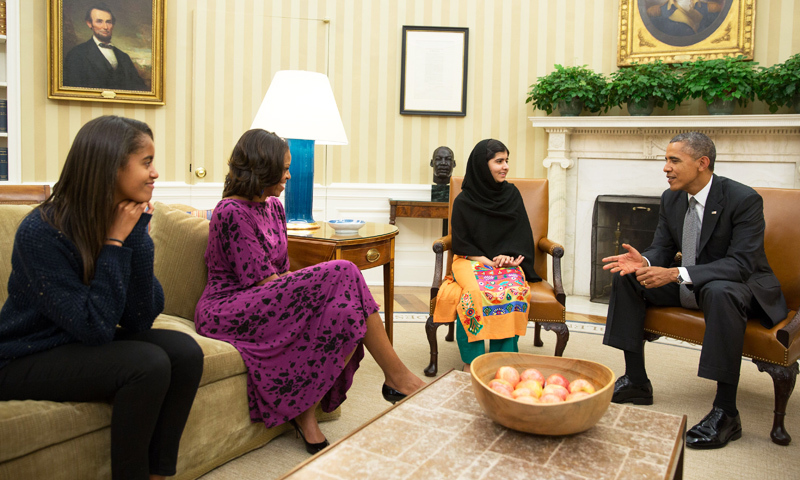 malala is turning into a nuisance . TTP can kill a dozen policeman yet miss a 16yr old at point blank. Are you wishing they hadn't? ^^ im merely questinoning the circumstances..
Are you suggesting victims of TTP terrorism who find support from the western world shouldn't have our sympathy? The truth of the matter is, in the deepest, darkest depths of our beings, the part of us we choose not to aknowledge, we are selfish creatures, nobody, Pakistani or otherwise cares if Malala lived or died (other than her direct friends or family), just the same as the tens of thousands of other victims of terrorism, who's names or faces we don't know. We only care about how this affects us, in this particular case, what impacts the words of a little girl have on our nations "image". If her press releases were polished by ISPR rather than a western agency none of us would give a sh1t about what she was saying, as long as the "image" was preserved. What really bugs people is that Pakistan/Pakistani's failed to spin this incident to their own favour. This girl was writing for BBC Urdu, her case got publicity, Allah had ordained she will not die that day, she was taken for the UK for treatment. Western diplomats, western Media spun the Malala angle, to get plus points, to "highlight again why our brave soldiers are dying in foreign lands" etc. The Pakistani state failed to spin a positive angle (as always), the mainstream media focused on the horror of it all rather than "oh look, our dear daughter, another victim of terrorism, woe is us, we must be spirited and strong in our resolve to defeat this monster and protect our children". Pakistani bloggers etc failed to spin the same angle (or other favourable angles). Instead of doing so, people decided to support the quasi-Taliban media campaign maligning her, photoshopped images of her bandage, consipracy theories. Right down to you and me, we have a choice whether we're going to re-tweet something positive about her (to take ownership of her), or something negative about her (to distance ourselves) and look at the choices people are making. The same was done about Aafia Siddiqui, rather than support "one of our own", we waited for the narrative to be written and then complained about our portrayal in the story. In terms of PR (which is what we really care about), Aafia/Malala different faces of the same coin, we fumbled to handle the PR side of both. It's not like Pakistani media/bloggers/individuals are incapable, people have spent years supporting Aafia, making sure people like you and me remember her name, it was just done too late, it wasn't supported at state level, now we see something similar, a split national approach to this incident. Both cases are a crying shame, both cases feature Pakistani's who have been the victims of injustice who have been let down by the state, and then later on non state elements, like the media, the NGO's, the general public. We don't really care what happened to them, we care about how it looks in the papers. If we cared about Malala or victims of drone strikes, we'd be in Waziristan, not behind our keyboards. Rachel Corrie cared about the people of Palestine and the Israeli expansionism. She died under a bulldozer in the Gaza strip. She wasn't carrying weapons or organising bombing, she was present to protest and protect, using her physical being. Something all of us are afraid to do. I apologise if I have offended you in any of what I say. The term you and me is used in the content of the general public, not specifically yourself or I as individuals. My words are not a reflection of the innermost feelings of everyone, that's not something I'm privy too, rather they're merely the perception I sometimes get, questions I ask myself. 1) of nearly 50,000 killed, injured , maimed in ttp attacks , why malala ? 2) whose paying for her treatment, her travel expenses, her speeches at UN , who is the PR 'team' thats training her to talk in front of the world..
im sorry, but this malala drama is full of loop holes.. I told you already, she was working for bbc Urdu. That's probably why she is not brain dead today.